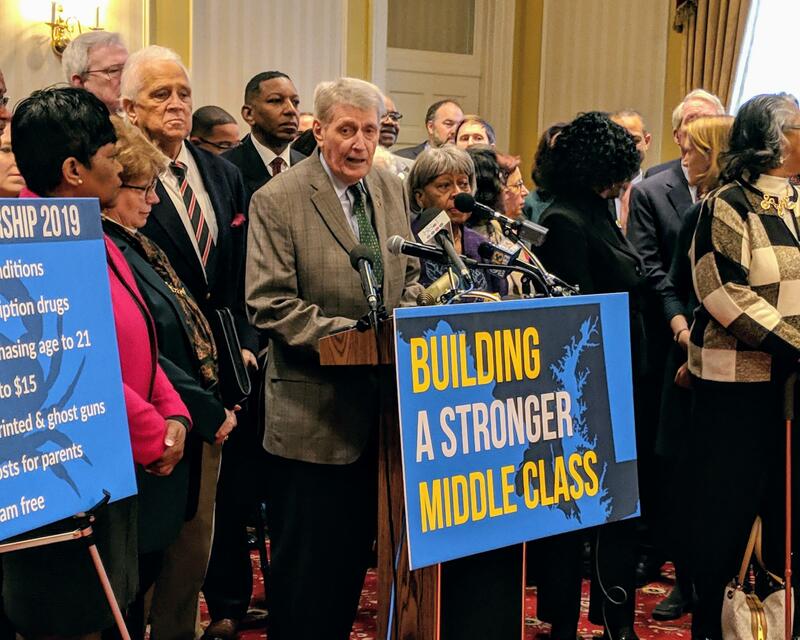 House Speaker Michael Busch and other Democratic legislators announce their support for a higher minimum wage at a press conference in Annapolis last month. Whitney Palmer owns a veterinary clinic in Berlin, Maryland. Bridget Dumais, with the Fight for Fifteen Coalition advocacy group, read a letter Palmer wrote in support of a higher minimum wage to the House Economic Matters Committee. She wrote that the higher wage will also increase consumer spending. Montgomery County has already begun its own phase-in of a $15 minimum wage. County Executive Marc Elrich told the committee that the change has been a boon for business. “Since we raised the minimum wage, employment has gone up, unemployment has gone down, and the doom and gloom predicted in 2013 did not materialize,” he said. Low-wage jobs force the county to spend more on social services, like food and housing assistance, he added. But Del. Steve Arentz, a Republican from the Eastern Shore, said he is concerned about the impact on small businesses, especially in rural areas. He asked if the proponents of the bill would be OK with allowing an exception for the Eastern Shore. However, they said the change needs to occur statewide to have the best impact.